E-media communications Ltd Uganda based leading web company that provides Web and E-commerce Solutions, Bulk sms services, Web Design & Development & Web hosting Services, Web Application Development, and Graphics & Logo Design & Search Engine Promotion. Our aim is to make our clients a brand and not just serve them and forget. In order to do so, we provide quality solutions that are reliable and fast. In our tenure of providing unmatched service since long. now Our quality services, affordable pricing, timely delivery and diverse expertise set us apart from other web site design and development companies all over the world. You can reach out to all your existing customers and approach the new would be customers all together in one go and satisfy them for a lifetime experience with your brand. 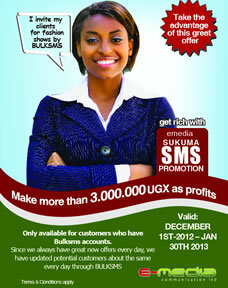 As the company is a pioneer for simplified and affordable bulk sms Business. We help businesses to implement SMS Messaging Services aimed to increase revenues, improve brand strategy, optimizing business performance and developing public services through Mobile Media from last 6 Years. With over 6 years experience in web designing and development, we can produce any site, from a simple static website to a complex database driven website. Your website must not only look attractive and be informative but also represent your brand. Our team of skilled web designers is able to create a top quality website for you that best represent your brand. We specialize in all areas of website design and development, blog set-up, Social media websites, blogs, news aggregators, content sharing networks, social bookmarking services and online networking websites. Let's face it! In the business world, good appearance counts. Customers trust and prefer companies that look polished & experienced! Let's face it! In the business world, good appearance counts! Customers trust and prefer companies that look polished & experienced. With a memorable identity and high quality graphics, your business can convey the sense of professionalism that is required for the success of any company… and that's where we come in! We deliver perfect graphics, layout and design concepts. Which are customized and designed especially for you and the public keeping in mind your company's identify and goals. From logos and corporate identity, posters, brochures, letter heads, Fliers, business cards and banners for communication to strengthen your brand, your corporate image and communication across all media we are the answer.